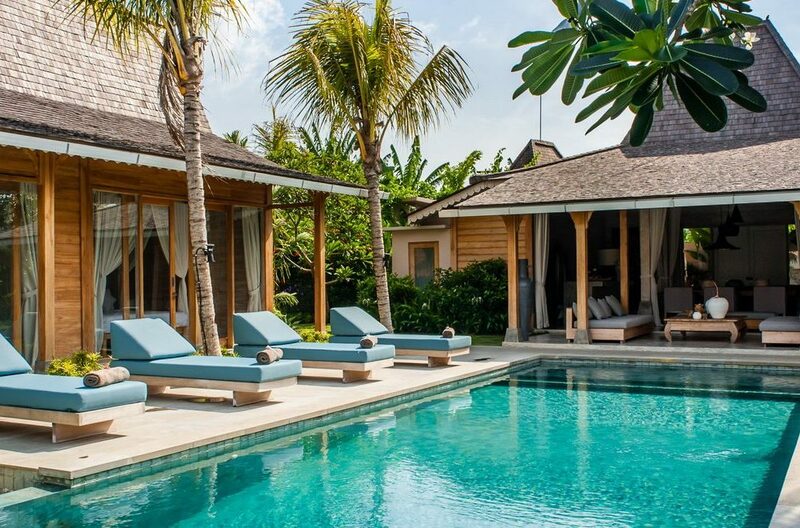 At Villa Taramille, contemporary and traditional Balinese influences merge into a luxurious three-pavilion complex that will be the setting for your best vacation yet. 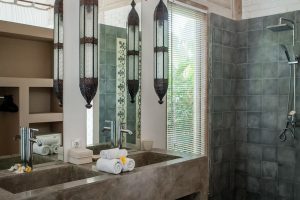 The glassy, refreshing waters of the twelve-meter pool are surrounded by plush bedrooms, open-air soaking tubs, beautifully furnished living areas, and all the premium amenities of a luxury resort. 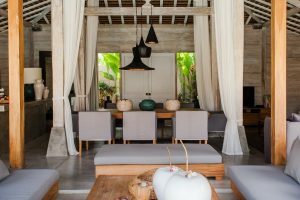 Set among rice fields in a quaint but modern community, this is an ideal home base for exploring the “Island of the Gods”. There are four deluxe bedrooms with ensuite bathrooms that sleep up to eight guests. 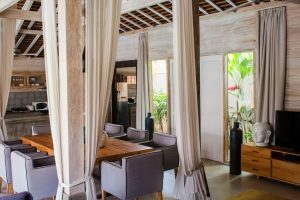 An epic indoor-outdoor open plan living area has something for everyone, including a modern kitchen where the resident villa chef can concoct savoury local delicacies for your entire party. Villa Taramille is ideal for a family vacation, intimate event, or group of friends. 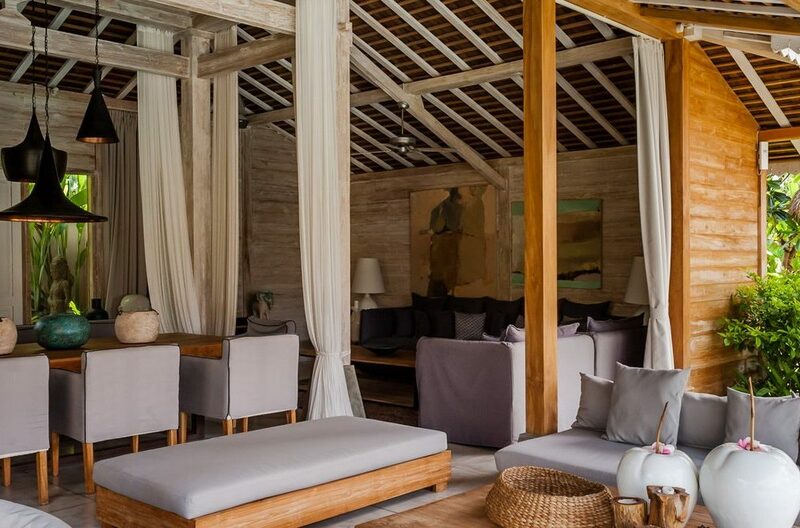 Villa Taramille is found in quiet Kerobokan, in the midst of Bali’s famous rice fields, with serenity and relaxation to spare. Its central location is nearby beaches, shopping, dining; and makes for easy exploration of the whole island. Full staffing provides excellent service and the finest in local hospitality. When you stay at Villa Taramille, you’ll find all the opportunities for recreation, pleasure, or rest that make a vacation great. 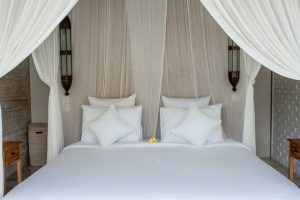 Four beautifully appointed bedrooms are divided between two pavilions on either side of the pool. 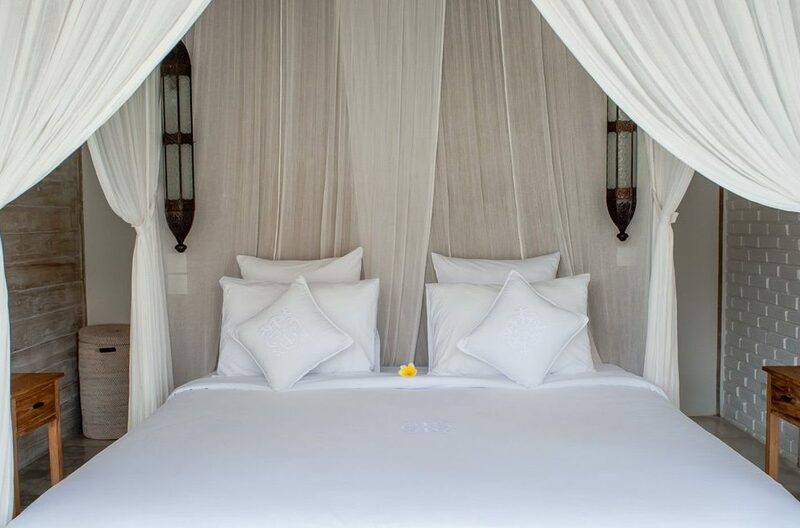 Two bedrooms (1 in each pavilion) host plush king beds, furnished with comfortable bedding and mosquito netting. The other two bedrooms (1 in each pavilion) are home to comfy twin beds pushed together, also with soft bedding and mosquito net draping. The twin beds can be separated to accommodate children or singles. 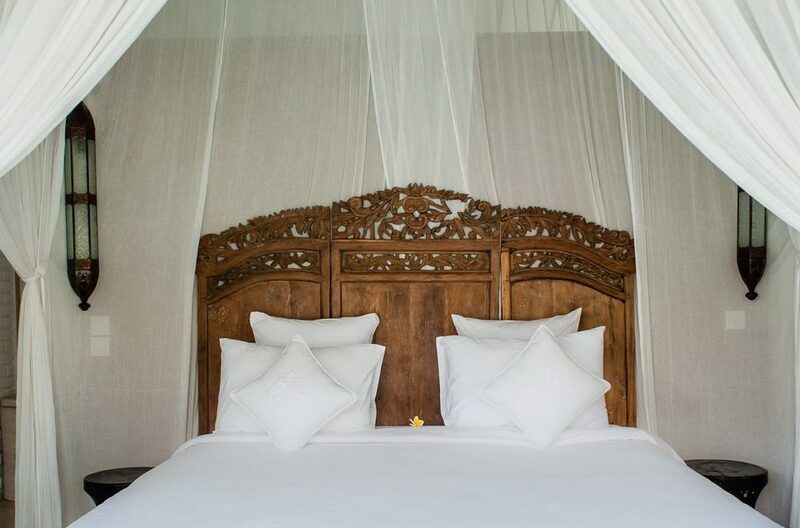 The white decor with wood furnishings and accents give the rooms a dreamlike quality that is perfect for a good night’s rest. All four bedrooms come with cold air conditioning to help keep you cool and comfortable. Glass lanterns, wardrobes for storage, and lots of little touches give the bedrooms a homey, relaxed atmosphere. Having the bedrooms in separate pavilions gives guests extra privacy, helpful for families with children or those who might need a little vacation from their vacation. 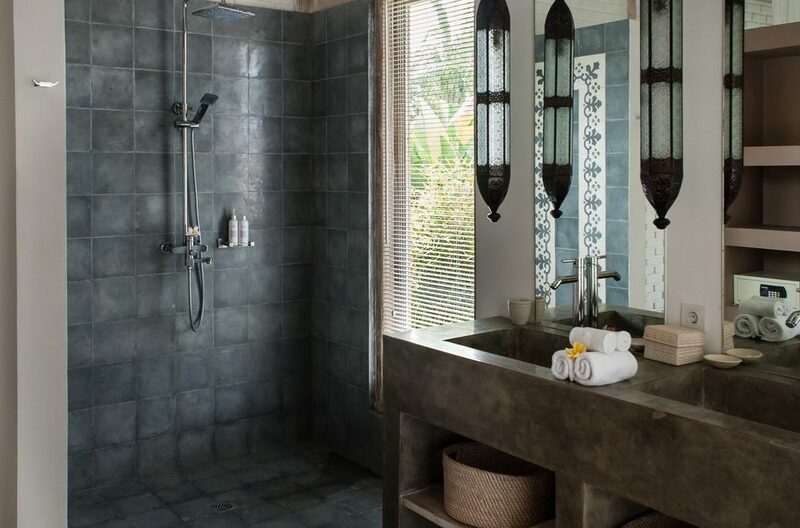 Each bedroom hosts its own ensuite bathroom, tastefully decorated with a mix of tile, stone, and antique accents. 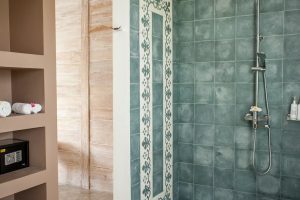 All bathrooms come standard with high-pressure rainfall shower stalls, marble wash basins, and all the cleanup necessities you’ll need to get yourself ready for the day. 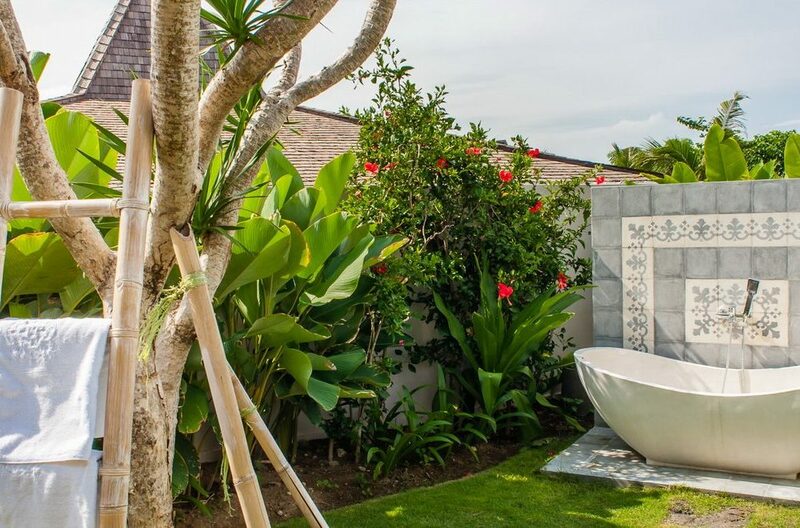 The stars of the show are the two outdoor soaking tubs that come with the king sized bedrooms. 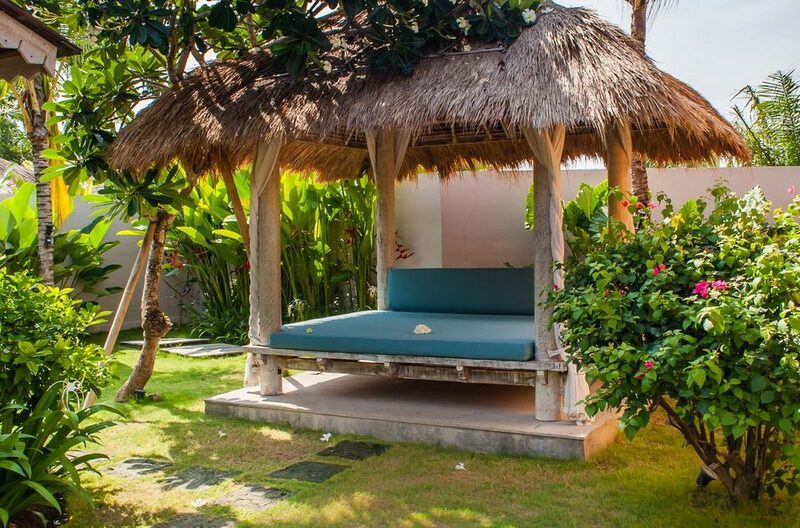 Sit among tropical garden greenery while you stare at the stars and soak away your cares, enjoying a moment of Bali fantasy that you richly deserve. In the largest pavilion, you’ll discover the wonders of the huge open-plan living area. Built in a traditional Balinese style but with chic modern furnishings, there’s something for everyone within this lovely space. To one side there’s an indoor media lounge where a cushy sofa and two matching armchairs frame a coffee table. Here you can gather your group for movie night on the flat screen TV equipped with cable channels and a DVD player. There’s also high-speed WiFi internet for when it’s time to Netflix and chill. 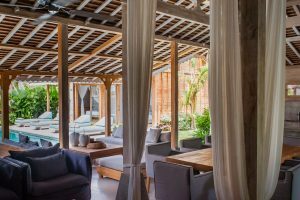 Towards the pool, there’s an outdoor seating area with dual sofas facing each other across a wooden coffee table. 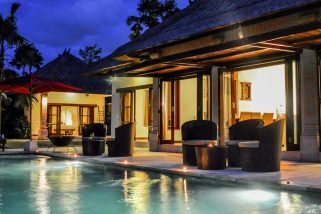 Here you may want to wind down with great conversation and flowing wine after an adventurous day in Bali. 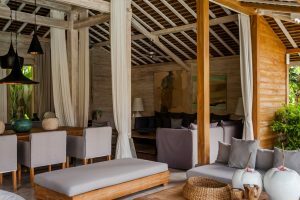 In the centre of the living area, under its high joglo-style roof, there’s a draped dining area with a beautiful natural wood table and eight upholstered chairs. 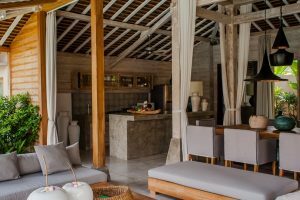 Have a family dinner and feast on local Balinese recipes, custom prepared for you from fresh local ingredients by the villa chef. The fully equipped western kitchen has everything needed for big feasts or small snack preparation, any time of the day. There’s also a long bar counter where you can sip an iced ‘kopi Bali’ and watch the kitchen cooking show take place. 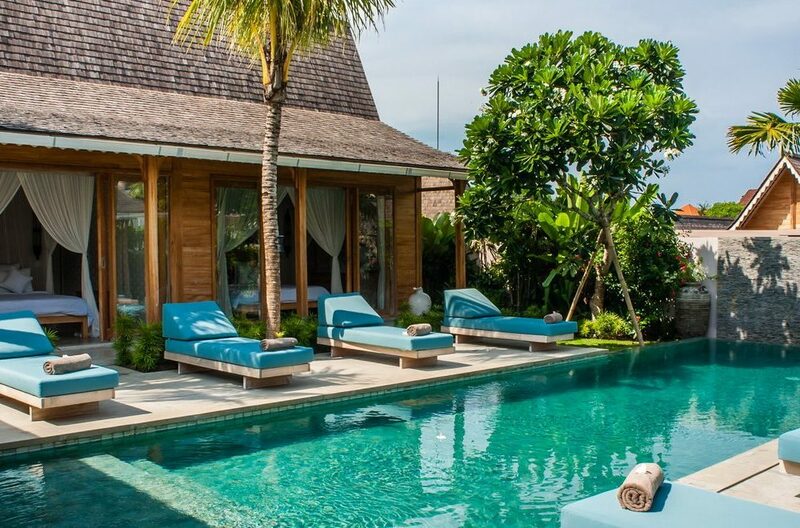 When it’s time to cool off, there are meters of clean refreshing pool to dive into. 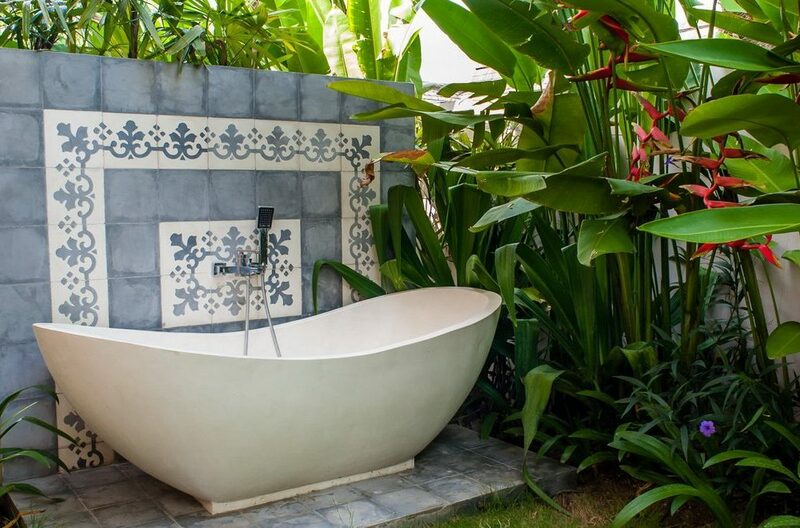 Take some exercise laps or just float away into a blissful state. 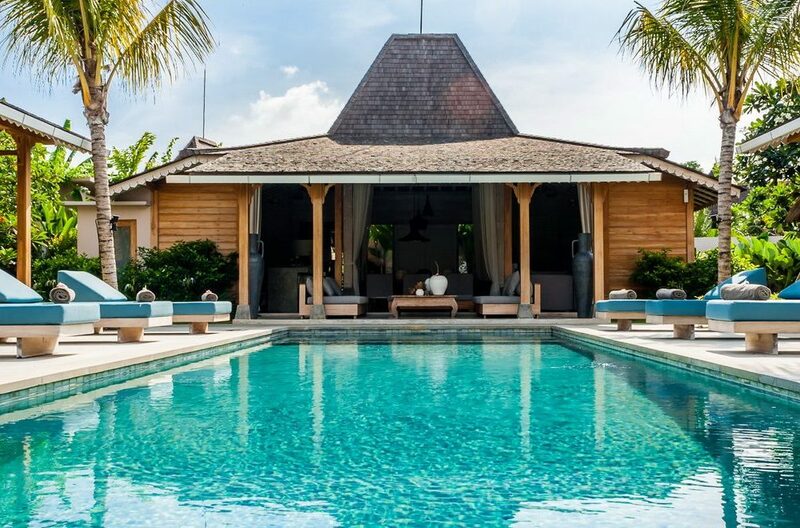 If you’d just like to lounge poolside, there are eight well-cushioned pool chairs to stretch out on and capture some vitamin D from the tropical sun. 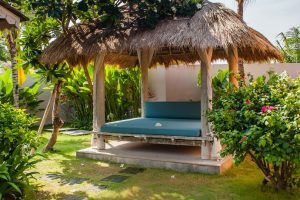 A covered bale with a thatched roof and large mattress in the flowering tropical garden is at the far end of the property. 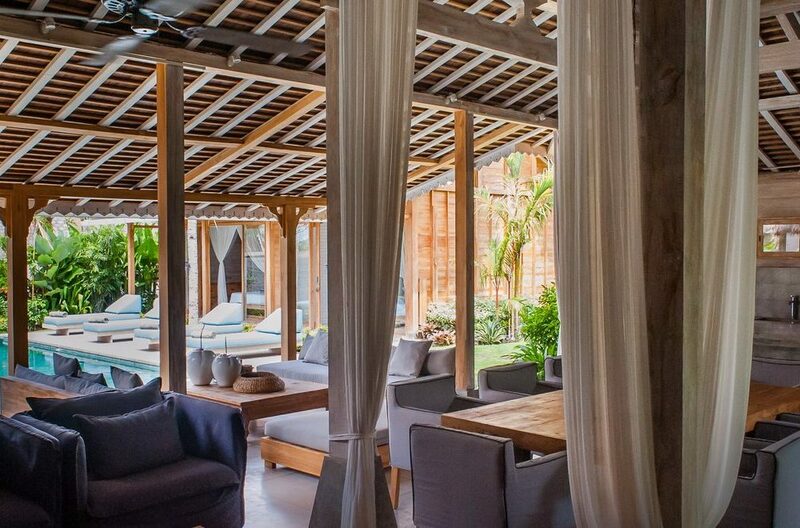 The bale is an enticing location for yoga asanas, meditation, reading, or a long afternoon nap. 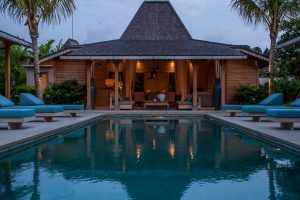 Villa Taramille’s staff is charming, helpful, and prepared to deliver you a vacation experience like no other. Our resident chef will cook up savoury meals in your own kitchen, to the delight of your guests. 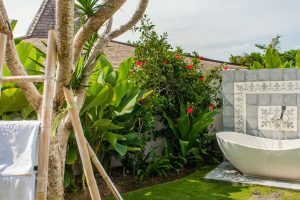 A housekeeper, gardener, and security team provide daily services to keep the villa looking and feeling great. Additional services can be easily provided on request, such as laundry, babysitting, transportation, or massage. Don’t hesitate to ask – we’re happy to take care of everything when you stay with us. Villa Taramille is situated in the quiet Seminyak neighbourhood among rice fields that create a serene and peaceful vacation location. You’re only a ten-minute car ride to Seminyak, the centre of the action in Bali. 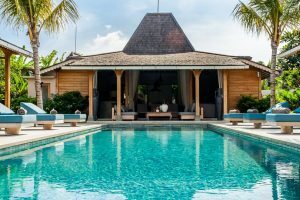 There you will find first class options for dining, fashionable boutiques for shopping, world famous beaches, and nightlife for every persuasion. Don’t miss the well-known Eat Street which is home to top rated restaurants such as La Lucciola, Mamasan, and Metis. You’ll find something to satiate any appetite here. If you’d like to go to the beach, the villa is centrally located a fifteen-minute ride from the surf and sand in both Seminyak and Canggu. 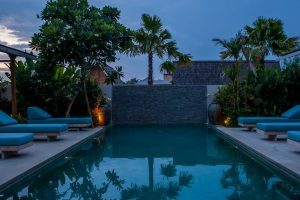 You’ll have no shortage of options for surf breaks if you wish to hang ten, and you can find a great beach club like Finn’s in Canggu or La Plancha in Seminyak if you seek sunset drinks and seafood by the seashore. Ask the villa staff to point you in the right direction. 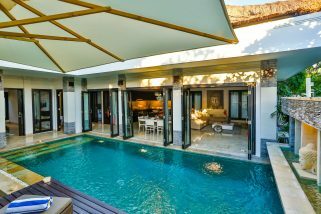 They will gladly help arrange transportation or tours as you explore Bali. 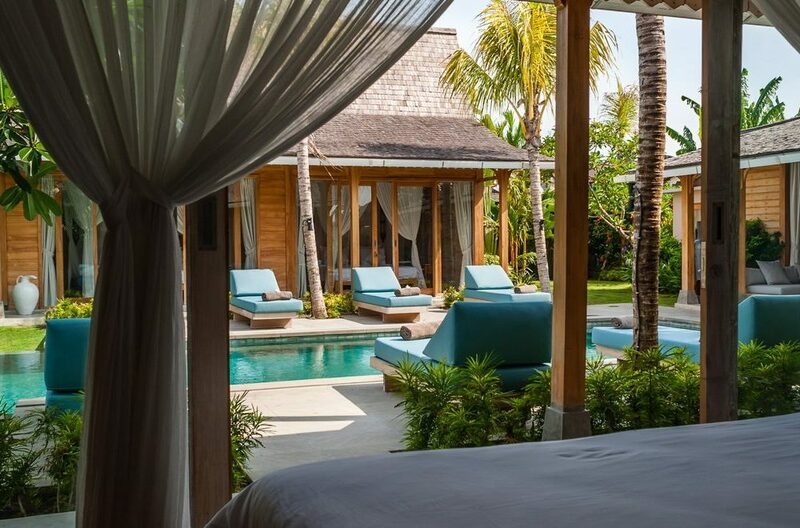 At Villa Taramille, the island holiday of a lifetime is at your fingertips, so grab it and go. 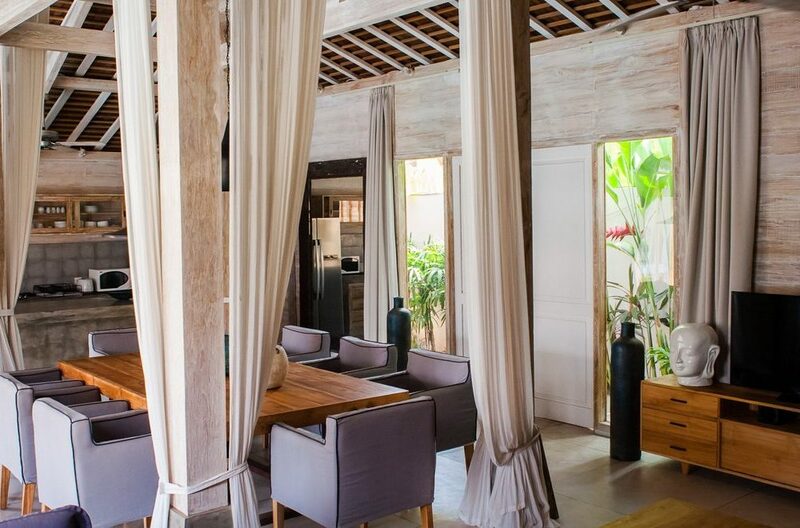 This fresh, stylish 3 bedroom Seminyak villa in Batu Belig on the outskirts of Seminyak fuses Mediterranean vibes with shabby chic to bring you an elegant place to throw off the cares of everyday life.